The Arizona Department of Transportation purchased its first drone in spring 2017, and agency spokesman Doug Nintzel said the aircraft has since been used for survey data and traffic videos. For example, Nintzel said ADOT has used the device to survey a section of State Route 88 that suffered rain damage as well as take aerial video of traffic to the Arizona Renaissance Fair, which takes place about 50 miles east of Phoenix and runs for about two months every year. ADOT’s one-drone fleet is growing. Nintzel said the department recently purchased eight more unmanned aerial vehicles — or UAVs, as drones are sometimes called — for bridge inspections and geotechnical work. Arizona is one of several state agencies that oversee a nascent drone program. According to a survey published March 27 by the American Association of State Highway and Transportation Officials, some 20 states use drones in daily operations and another 15 states are researching the best use of drone technology. Like Arizona DOT, Delaware and Colorado officials also use drones to monitor traffic and parking lots during special events. DelDOT Homeland Security Planner Dwayne Day said the drones offer situational awareness of NASCAR races and the Firefly Music Festival, both of which occur at Dover International Speedway. Colorado DOT used drones to monitor traffic when Tim McGraw performed at the U.S. Air Force Academy, according to Intelligent Transportation systems Technology Manager John Williams. DelDOT has a fleet of 11 UAVs, which are operated by seven agency employees who were trained to pilot the devices. In the future, Day said the agency is planning to use drones for thermal imaging and accident inspections. “It’s a critical part of us knowing the information, but it also helps get information out to the traveling public,” said Gene Donaldson, director of DelDOT’s Transportation Management Center. Drone operators must adhere to some basic rules outlined by the Federal Aviation Administration when flying UAVs. They are not allowed to fly the craft above 400 feet, they cannot fly above moving traffic unless they have a special permit, and they can only operate during daylight hours. Nintzel said a special case in which drones would be allowed to fly over moving traffic would be to get footage of large highway construction projects, such as roundabouts. Ohio’s drone program is housed within the state’s DriveOhio initiative, a partnership of public agencies, private firms and research groups that develop and test autonomous technologies. Fred Judson, acting director of the Ohio/Indiana Unmanned Aircraft Systems Center, said Ohio’s use of drones focuses primarily on data collection. This collection ranges from scanning areas susceptible to rockfall to taking video of diverging diamond interchanges so the public can see how to navigate the configuration. Similarly, Colorado DOT uses drones to monitor freight behavior on interstates and incorporates the video into demonstrations, according to the agency's Multimodal Planning Branch Manager Tim Kirby. Judson said certain drones have thermal cameras that can detect delamination on bridge decks that may have suffered water damage. Ohio’s drone team, which oversees a fleet of seven UAVs, has been asked to conduct bridge inspections once a year. In 2016, Iowa DOT started flying drones around public airports to capture aerial images, according to Tim McClung, planning and outreach manager for the agency’s Office of Aviation. Iowa DOT later ventured into photography of heliports at private locations, such as hospitals. Since then, the agency has used drones to collect data for surveys of wetlands and highways. 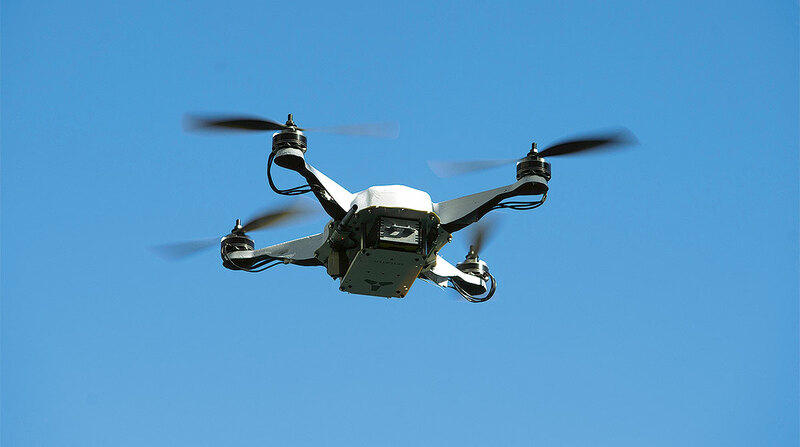 Iowa DOT has also used UAVs to lead education outreach programs with pilots, law enforcement officers and state legislators to discuss safe integration into airspace.